Sorry to bother all with my scheduled Japan travel posts, but I am appreciate very much to those who left comment even i was away for vacation. Actually i spent quite a lot of time trying to finish this Japan travel post before i go for vacation, in fact still have 1-2 two more posts to go..hehehe..
After 7days of eating Bali foods (Babi guling, Bebek(duck), pork ribs & etc), soon i returned home, i really miss Nasi Lemak and Chinese foods..So I cooked this tofu dish, also cooked white cut chicken, stir fried green veggie and ABC soup soon i returned from Bali. 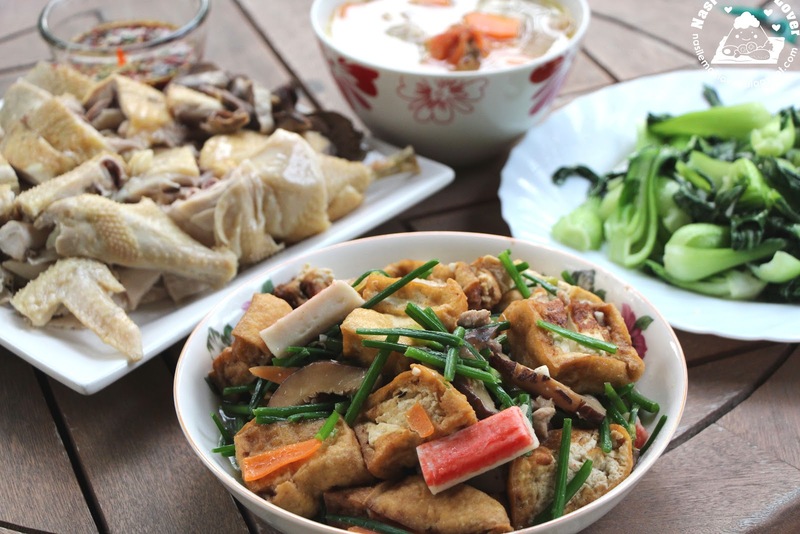 This is a typical homecook Chinese dish that i like to prepare for my family. 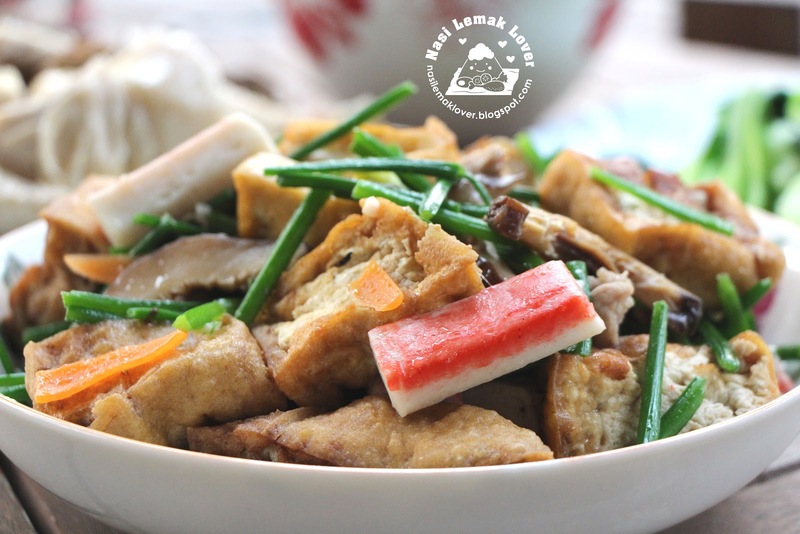 Usually i don't add crab sticks into tofu dish, but spotted ﻿Rice Bowl Tales added crab sticks (sorry, can't really remember in which post) , so i also cooked this way..Ya, add crab sticks only at the end of cooking, if you add in too early, the crab sticks will tend to be broken..
1. Deep fry tofu till golden brown, set aside. 2. Heat oil in a wok, sauté garlic and add in meat, mushroom and carrot, stir fry till mix well. 3. Add in water and bring to boil. Then add in fried tofu, season with light soy sauce, dark soy sauce and salt. 4. Cook over medium heat for about 5mins as to let tofu absorb the seasonings. 5. Add in chive flowers and crab sticks, lightly stir to mix well, cook for 1min. 6. Dish out, serve hot with rice. feel hungry now when i see your chicken and tauhu dish, homecook meal is always comforting no matter how simple it is. sonia, u really make me envy la, always cuti cuti keluar malaysia， nice photos taken. I love the way this tofu is cooked... tastes good with chives. Hope you had a great holiday in Bali! So nice to have you back..:)Misses your dish posts. ABC soup and tofu dish is my family favorite too. Can't wait to see some of the Balinese food that you've tried ! Ya, after a holiday, we always miss homey kinda food. When we were in Bali last year, i didnt enjoy the food because most of it were fried and spicy, and i was missing all the clear, soupy and fresh vege kinda dish that we have here hahaha. I like this dish, havent cooked with chive flowers for a long time. Looking at this dish reminds me that it has been a while since I last had chive flowers. 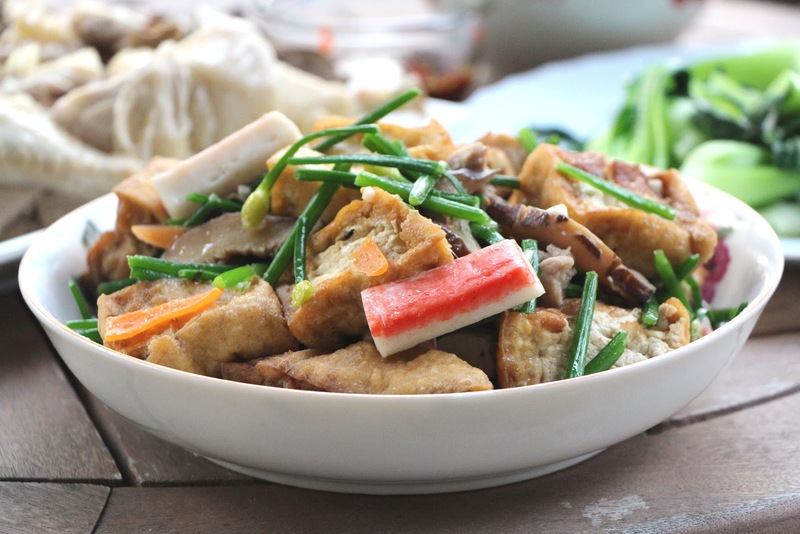 I must try this dish...it must taste delicious with the tofu and crab stick. Thanks for sharing the recipe. same as you. i also will cook this type of food for my family. i never cook chive flowers with taufu. try next time. This is homey and delicious. Nothing beats home-cooked food anytime, welcome back! I enjoyed your Japan posts too, but welcome back! Last time I also like to add crabsticks to my vege dishes, but nowadays not so much anymore. After a week of cuti-cuti you must be missing homecooked food lah :)Nice tofu dish! I do enjoyed reading the post regarding your Japan trips, lot of beautiful scenery, I believed no one will think it bother them too. 九菜花！！ My all time favourite! I love this kind of Chinese cooking, fulled of 家乡味， just now when I was reading, wondering what is white cut chicken, haha, what a good translation! Hey, welcome home and still in one piece. haha.... I bet you missed home. Have a lovely weekend, dear. Sonia, it is my kind of food too. I do love flower chives and don't use enough of it. I can see this in a clay pot version. I've seen Chive flowers in Chinese market and wonder if those are edible. I love your meals on the table. What a feast!!! Wish I could come back from vacation and eat this amazing meal!